The calendar has turned to May and with it came an announcement from Full Flush Poker of a gigantic reload bonus and increased tourney guaranteed prize pools. The flagship skin on the Equity Poker Network (EPN), Full Flush is rewarding its loyal players with a 100% up to $600 reload bonus on their first May deposit. That same bonus was available in April and table chat among players indicated that many who were busily clearing the massive bonus were hoping that Full Flush would continue offering the promotion in future months. The powers that be at Full Flush apparently were monitoring chat at the tables and answered those player wishes by continuing with the huge reload bonus. But there is more to like about the bonus! Players are also in line to receive an extra 10% cashback instantly on all deposits over the amount of $200 that are funded via the deposit options of Money Gram, Western Union, Skrill, Neteller or EcoPayz. That add-on bonus of 10% allows maximum bonus earnings up to $200. A second add-on VIP loyalty bonus pays another 10% instant cashback up to $200 on all deposits over $1,000. So the reload bonus has a maximum value of $1,000 when the add-on bonuses are factored in. In other words, a deposit of $2,000 in May using any of the aforementioned deposit methods is good for $600 after the required bonus points are cleared. An amount of $400 is credited to player accounts instantly, $200 for using the preferred deposit options and $200 more as a VIP loyalty bonus for depositing over $1,000. Tournament players will be pleased to know that another $40,000 has been added to guaranteed prize pools for the month of May. That $40k will be spread out among a number of tournaments, the first of which is the $1500 Guaranteed Nightly American. The prize pool for that players’ favorite has been kicked up to $2,000 guaranteed. Next on the docket for May is boosting the Late Night $1,000 Guaranteed that’s exclusive to Full Flush players up to a $1,500 guaranteed prize pool on Friday and Saturday. That tournament kicks off at 10:00 p.m. and features only a $3.50 buy-in, attracting a number of low-stakes players. A brand new tournament has been added to the schedule beginning in May. A $3,000 guaranteed 6-max will be hosted on EPN every Saturday at 3:00 p.m. Weekend players will also be happy to know that the $2,000 GTD Big Deepstack on Saturdays at 1:00 p.m. will have a reduced entry fee. The buy-in for that event has been slashed from $10 to only $5 and will keep the same guarantee. As you can see, there is a lot to be excited about at Full Flush Poker this month. Since launching in November, EPN has been attracting a steady growth of players. The network is U.S.-friendly and has made quite an impact in the industry in just six months. Players who have yet to deposit at Full Flush are entitled to a 150% up to $600 Welcome Bonus and 20% instant cashback on any deposits over $50. 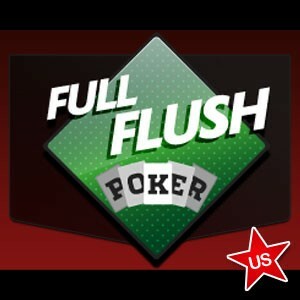 Take a look at our Full Flush Poker review for more information.